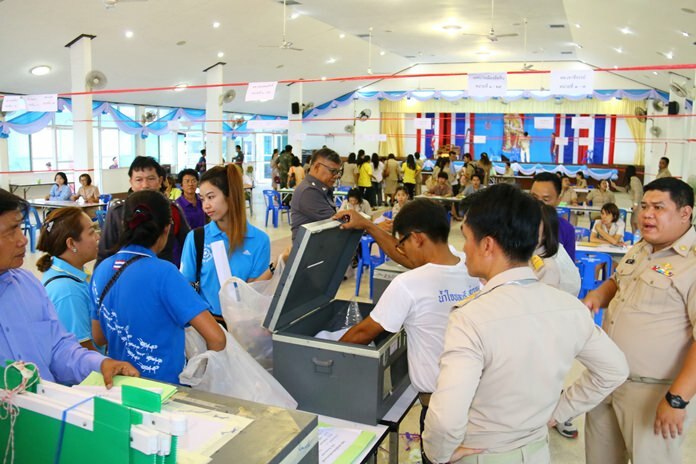 Pattaya-area voters gave overwhelming support to the new constitution in the Aug. 7 referendum, although voter turnout fell far below the nationwide level. Pattaya-area voters gave overwhelming support to the new constitution in the Aug. 7 referendum, although voter turnout fell far below the nationwide level. 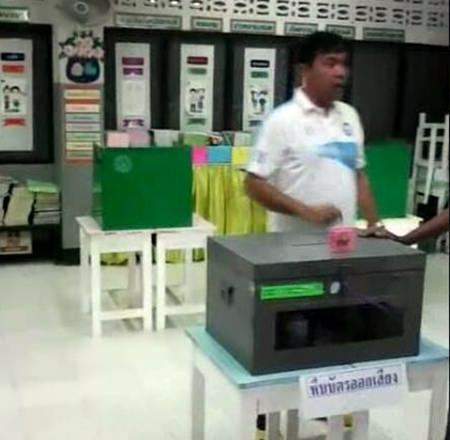 Shown here, Pattaya School 5 was busy with patriotic citizens coming in to place their ballots. Nationwide, the referendum passed in a landslide. 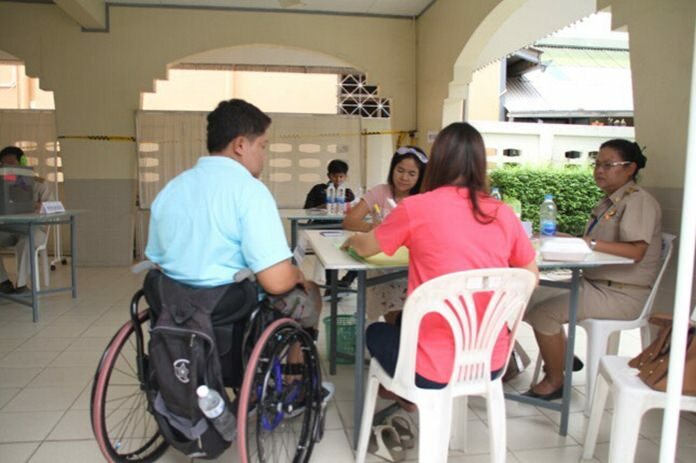 Voters began showing up to the Banglamung District office, Banglamung School, Pattaya School No. 2 and Pattaya City Hall at 8 a.m. to cast their “yes” or “no” vote for the proposed constitution and a question on whether they wanted the appointed Senate to choose a prime minister. The “yes” side won the nationwide vote by a commanding 61 percent. The “extra question” also was approved, although by a slimmer margin. Banglamung’s voters showed more approval of the draft charter, voting 68.6 percent in favor. 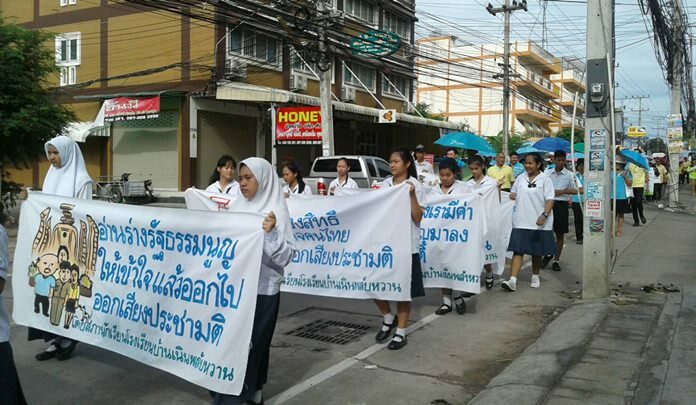 Students from Nernplabwan School held a campaign to encourage people to come out and vote. 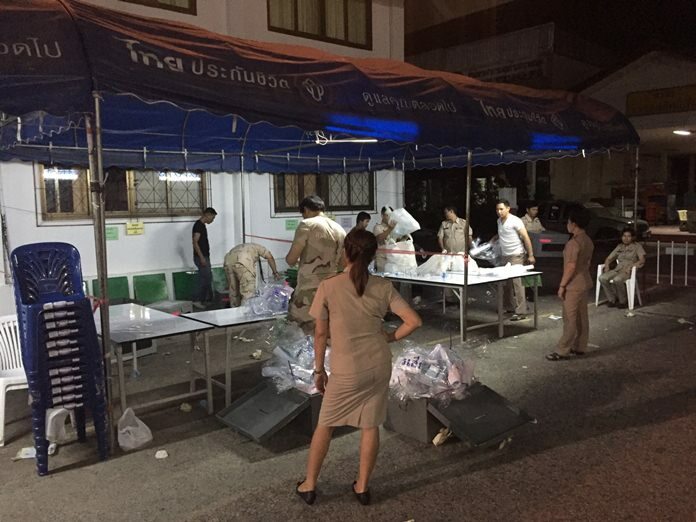 Police, volunteers and naval personnel were stationed at polling booths to secure the scene and local authorities were on hand to give explanations of what the draft constitution would do or not do. District Chief Chakorn Kanchawattana said no problems were reported. Police kept a close watch on polling stations to make sure everything ran smoothly. A total 209,289 registered voters were entitled to cast ballots. However, only 45 percent actually turned out, below even the poor nationwide turnout of 55 percent. Election Commission members had optimistically forecast an 80 percent turnout. 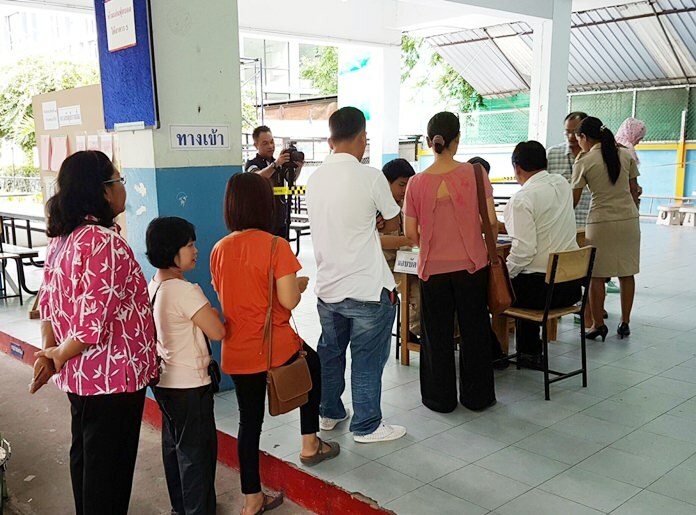 However, many voters who came to Pattaya to work but were not registered to vote here were forced to go to Chonburi City Hall instead, pushing down Pattaya’s turnout. Voting areas near Nernplabwan were busy with patriotic citizens turning up to cast their votes. In military-dominated Sattahip, the junta-drafted constitution was overwhelmingly approved by a 71 percent margin. But voter turnout came in at less than 47 percent. 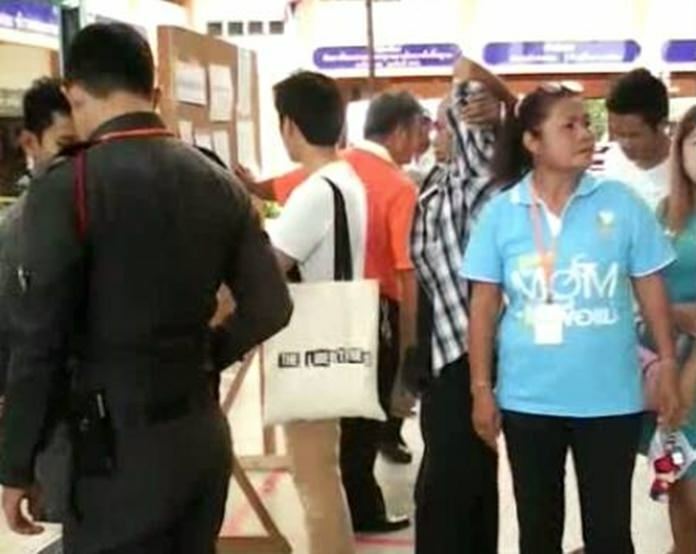 The vote was not without incident, however: Boondej Jomkaew, 67, was arrested for tearing his ballot in half. He said he was confused and it was a mistake. Chonburi Province-wide, voter turnout was especially low, coming in at just 22.9 percent. Another busy area was St. Nikolaus Church near Central Pattaya. Sattahip officials begin tabulating the results. 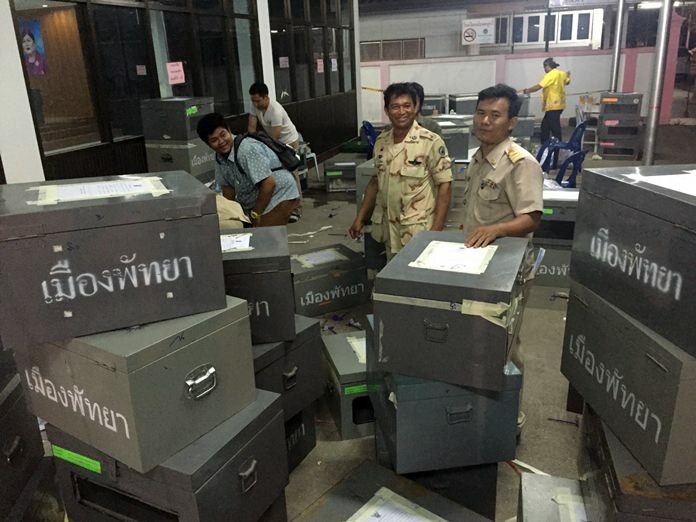 There were many ballot boxes filled in Banglamung. Vote counters worked well into the night in Banglamung. 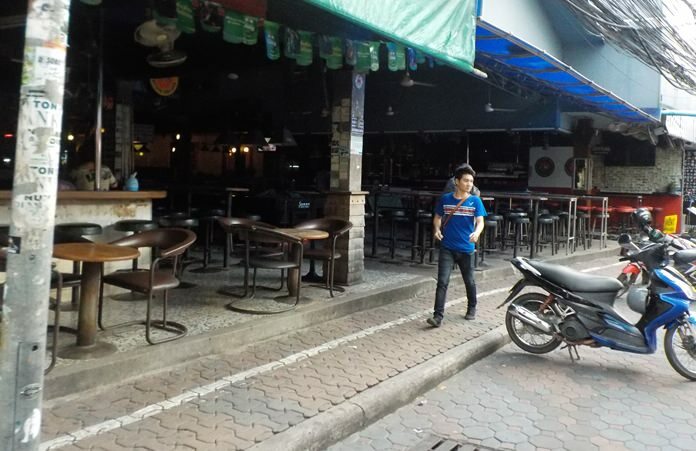 Since it is illegal to sell or give away alcohol during election weekends, Pattaya’s entertainment area was quiet from 18.00 Saturday, Aug. 6 until almost midnight Aug. 7. 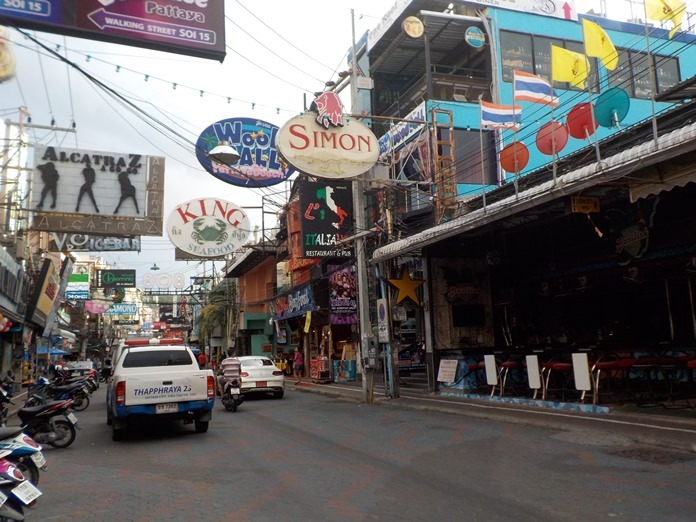 Walking Street was practically a ghost town during the elections. According to unofficial results released by the Election Commission (EC), the draft constitution has been approved by the majority of Thai voters. The electoral body announced on Sunday the unofficial outcome of the nationwide public referendum on the draft charter, saying 15,562,027 people or approximately 61.45 percent voted in favor of the draft whereas 9,784,680 people or 38.55 percent voted against. As for the additional question, 13,969,594 voters approved the question while 10,070,599 people rejected the question. Voter turnout on Sunday was 27,623,126 which accounted for 55 percent of all eligible voters numbering 50,585,118. Following the referendum, the constitution will soon be promulgated while general elections are expected take place in 2017 as scheduled. Official results of the charter referendum were released on Wednesday, August 10th.